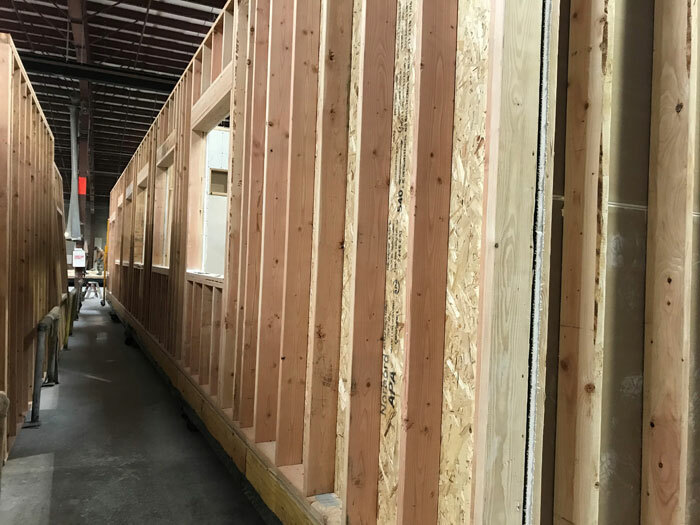 Photos by Hannah Johnson/King County: King County continues assembling its modular buildings in Marysville that will later be brought to Seattle for a new 24/7 low-barrier shelter on Elliott Avenue. Uptown Alliance representatives had a second meeting with King County and Catholic Community Services officials on Tuesday, April 2, to discuss reaching a Good Neighbor Agreement ahead of the opening of a modular homeless shelter on Elliott Avenue this summer. 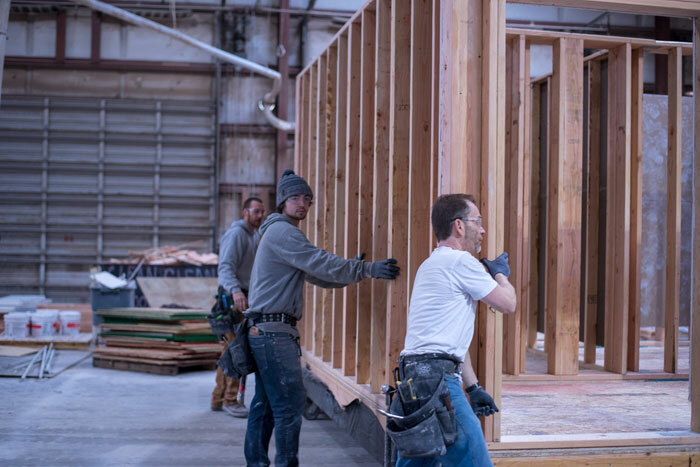 King County’s Department of Community and Human Services is opening the modular shelter, which is part of a pilot program announced by King County Executive Dow Constantine last August. Catholic Community Services will operate the 24/7 low-barrier shelter, which is expected to serve 72 people experiencing homelessness on surplus county property at 531 Elliott Ave.
King County and CCS representatives provided information about the shelter at a meeting in Queen Anne last December, followed by a presentation at the Uptown Alliance’s January meeting, where residents expressed a number of concerns. King County staff met with Uptown Alliance co-president Rick Hooper and other UA members after the meeting, where a Good Neighbor Agreement was suggested. A Good Neighbor Agreement was developed with the White Center Community Development Center before a family shelter opened in 2017, and a GNA commits operators to maintaining communications about shelter operations and addressing any issues that may arise. The April 2 meeting provided the Uptown Alliance an opportunity to respond to a draft agreement provided by the county that was used as a starting point for negotiations. Uptown Alliance wants there to be a mechanism in place to provide more police emphasis patrols in the area if drug or property crime issues do increase, to consider improvements to Elliott Avenue for pedestrian safety near the shelter, commit to providing shelter residents with on-site services, have the ability to respond quickly to any trash that accumulates outside the shelter, and to provide at least an annual report on the success of the program. “This is supposed to be the opportunity for a low-barrier place where people can come in and maybe get referred to some services,” Frausto said, and the Uptown Alliance. Mark Ellerbrook, King County Housing and Community Development division director, has been leading development of the modular shelter and working with Uptown Alliance toward adopting a Good Neighbor Agreement. Two-thirds of the April 2 meeting was focused on Uptown Alliance’s request that the agreement include language that prioritizes people experiencing homelessness in the neighborhood for shelter. Ellerbrook said the request is understandable, and King County and Catholic Community Services will work with their outreach partners to identify areas where they can engage with homeless populations in those areas. Queen Anne Community Council chair Ellen Monrad was invited by Hooper to attend the April 2 meeting, and provided an update to QACC the following evening. Monrad said there are many people living unsheltered in Queen Anne’s greenbelts that should be served. Ellerbrook said those areas would likewise be considered when providing outreach to those who may use the shelter when it opens this summer. 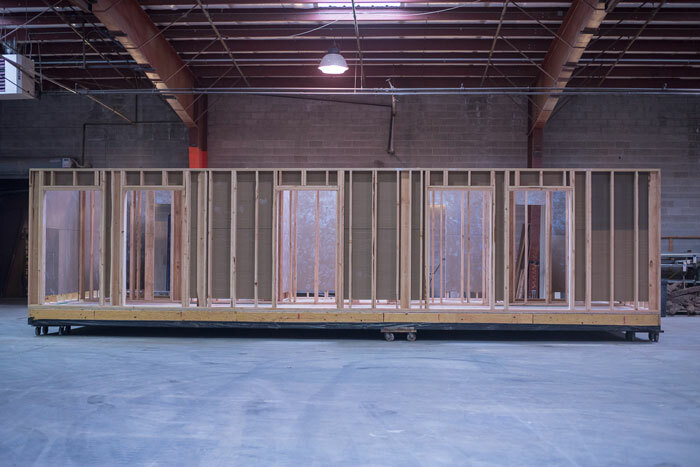 The dormitory style units are currently being assembled in Marysville, and will later be trucked to the surplus site owned by the King County Wastewater Division. There will nine dorms with eight beds each, plus a full kitchen facility, dining area, bathrooms, laundry and case management offices. While the Uptown Alliance is taking the lead as the community sponsor for the Good Neighbor Agreement, Ellerbrook said representatives from upper Queen Anne are welcome to be involved. Ellerbrook remains confident the agreement will be in place well in advance of the shelter’s opening.